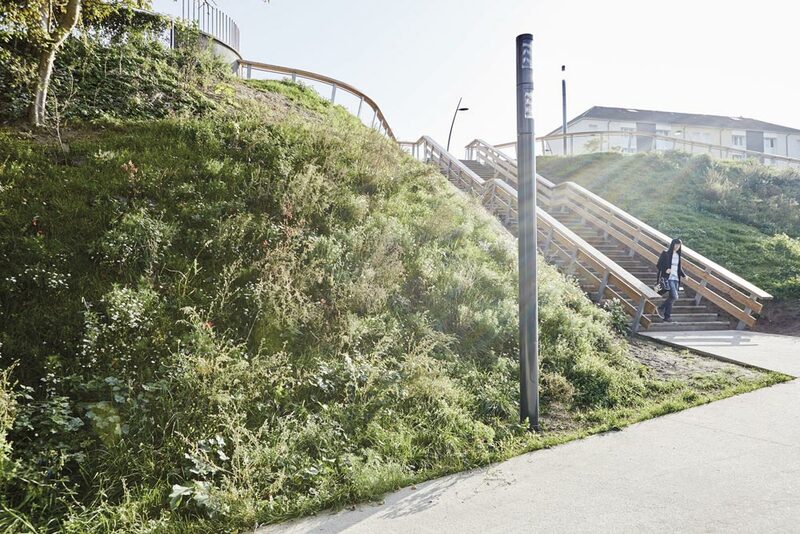 How to connect the city center of Creil to the edge of the Oise, to a district positioned on a plateau while crossing a remarkable landscape on a vertical of 40 m? 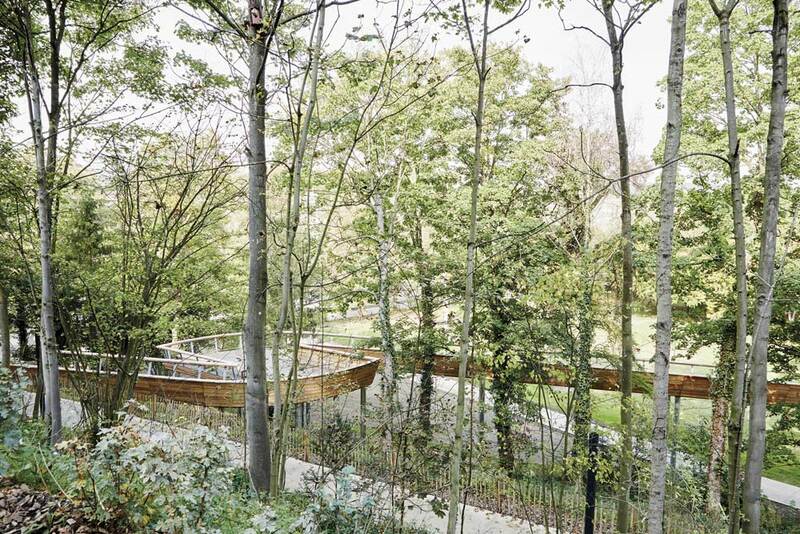 That was the main challenge in this project, led with determination by the team at the firm Espace Libre, landscapers and urban planners, with the support of the city of Creil. 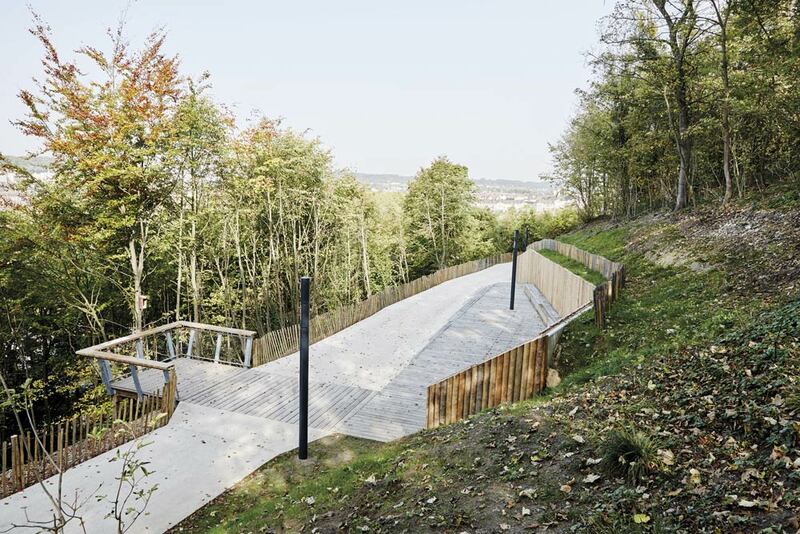 “The originality of this operation is due to an initiative that decided to connect an isolated district of the city center with the creation of an urban ramp through a wooded hillside,” says Maxime Saïsse, landscape architect and founder of Espace Libre. What might have been a banal development operation turned into a real project featuring the landscape, ecosystems and views. 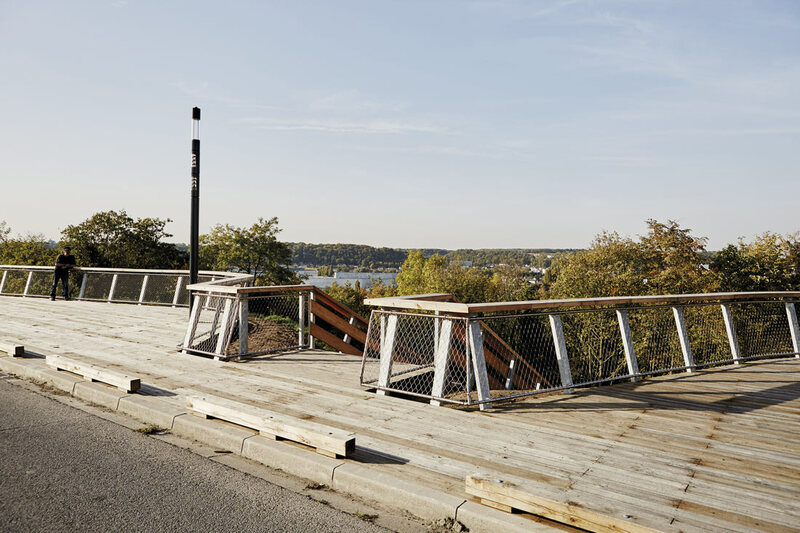 The sensitive layout of pathways and observation platforms is part of a natural process, rather than adding new uses to the site. Located north of Paris, Creil is a city that developed strongly in the post-war period through the emergence of neighborhoods characteristic of the period. 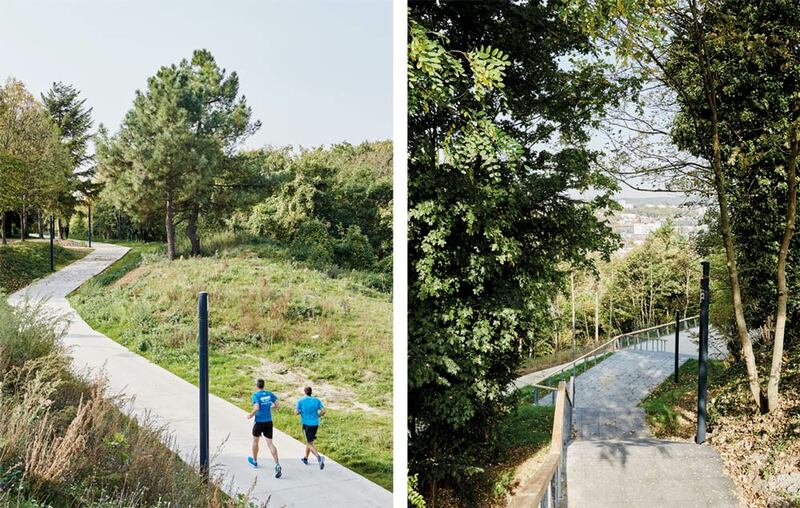 A dense urban neighborhood developed on the heights of Creil, 40 meters higher than the city center, cut off by a wooded hillside. This spatial configuration resulted in an urban break that never allowed inhabitants to connect with the city center, except by a monumental staircase. 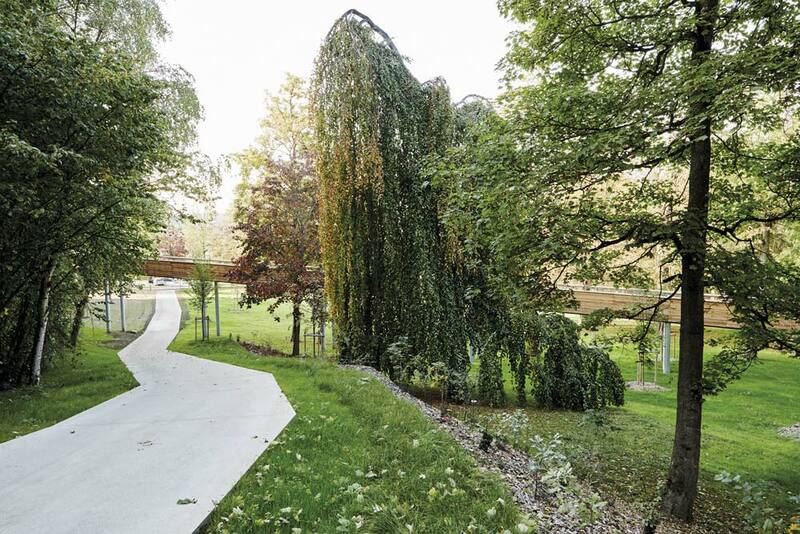 The desire to connect the neighborhood to the city center less abruptly, in keeping with new standards of accessibility, was an opportunity to think about a global project that included the ecological restoration of the site, the hydrographic network and endemic plant species. Following a careful study of the site, an inventory of its potentials and a detailed study of the nature of the soil were conducted in order to minimize the environmental damage. The path of the route is intended to minimize disruption, while revealing the characteristics of a remarkable landscape. 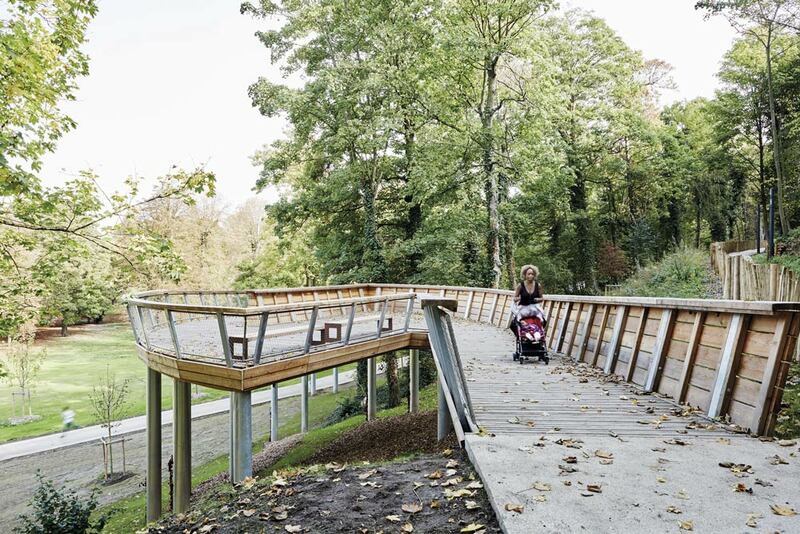 This set of constraints accentuated the strength of the project, in particular through the inclusion of a footbridge at the bottom of the path, providing a level surface essential for complying with reduced mobility regulations. 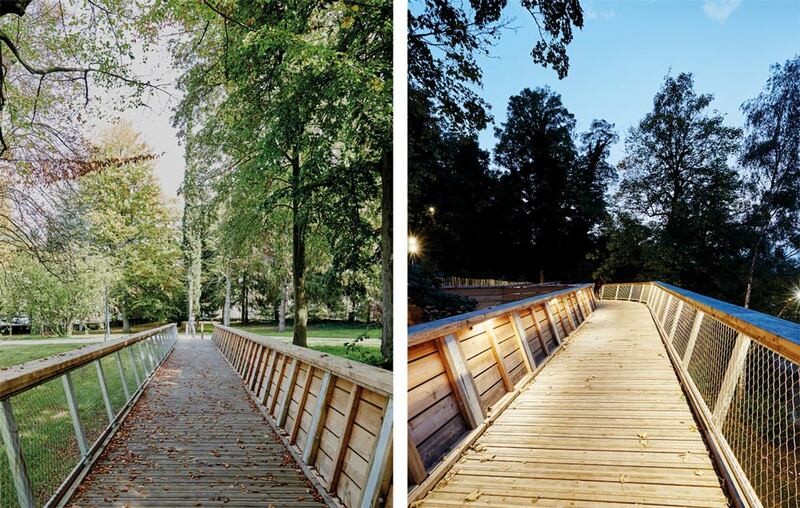 This majestic bridge is more than 100 meters long and rises through the treetops of an English park. The belvedere at the top of the bridge provides an exceptional view over the city and the Oise. 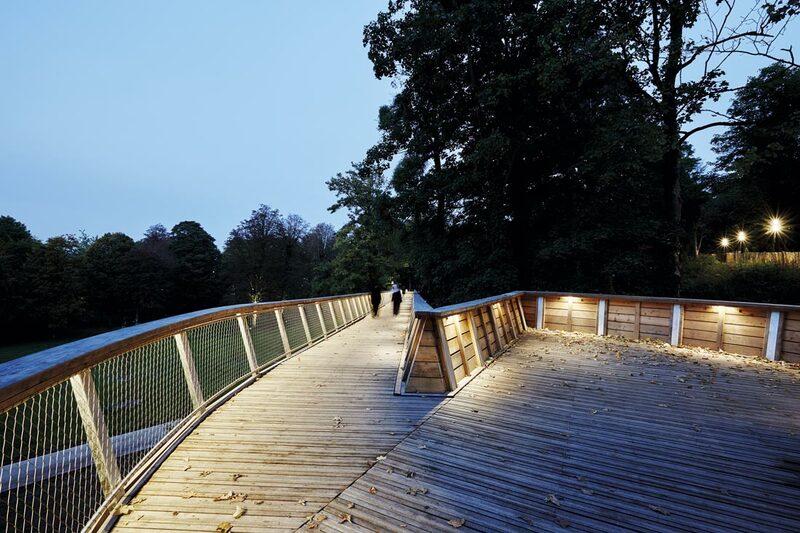 The structure of the steel bridge, with oak and larch wood finishes, allows it to withstand vibrations and the force of the winds. In each of these spaces, the signage highlights local endangered species. Their treatment promotes sensitivity and sobriety; the images appear in black and white and are enlarged to provide a glimpse of the “faces” of these often unknown species that share our ecosystem.